Few golfers want to see their ball land in a bunker. But when it does they need to know the rules of playing out of that hazard. Knowing the rules can save a golfer unnecessary penalty strokes. The definition of a bunker tells us that a bunker is a hazard consisting of a prepared area of ground, often a hollow, from which turf or soil has been removed and replaced with sand or the like. Grass-covered ground bordering or within a bunker, including a stacked turf face (whether grass-covered or earthen), is not part of the bunker. A wall or lip of the bunker not covered with grass is part of the bunker. The margin of a bunker extends vertically downwards, but not upwards. Because a bunker is a hazard, the Rules for playing from a bunker are similar to the Rules for playing from a water hazard. The main differences are encountered when taking relief from immovable obstructions, abnormal ground conditions and under the unplayable ball Rule (Rule 28). A movable obstruction can be removed from any part of the course, including a bunker or water hazard. Movable obstructions are artificial objects such as rakes or drink cans which can be moved without unreasonable effort, without unduly delaying play and without causing damage. 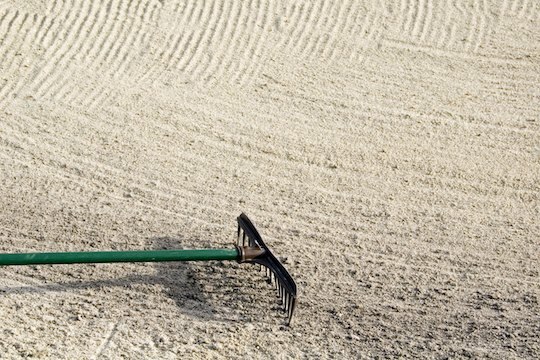 If you were to remove a movable obstruction, say a rake, lying near your ball in a bunker and the ball moves it must be replaced, and there is no penalty, provided the movement of the ball is directly attributable to the removal of the rake. Accidentally kicking the ball with your foot is not considered to be directly attributable. If your ball lies in or on a movable obstruction in a bunker, say a plastic bag, you may lift the ball and remove the plastic bag. You must then drop the ball as near as possible to the spot directly under where the ball lay in or on the plastic bag, no nearer the hole. Immovable obstructions are artificial objects such as pipes, drainage grates or wooden steps which cannot be moved without unreasonable effort, without unduly delaying play and without causing damage. You may drop the ball outside the bunker, under penalty of one stroke, keeping the point where the ball lay directly between the hole and the spot on which the ball is dropped, with no limit to how far behind the bunker the ball may be dropped. If you elect (or are required) to take relief from an abnormal ground condition, such as casual water, in a bunker, you have the same options listed above under the Immovable Obstruction Rule; i.e. you may drop the ball in the bunker without penalty or drop the ball outside the bunker under penalty of one stroke. However, there are times when full relief may not be available from casual water in a bunker. The bunker may be flooded to the extent that there is nowhere in the bunker that the ball can be dropped no nearer the hole without interference from the casual water. In these circumstances, you may drop the ball without penalty, as near as possible to the spot where the ball lay, but not nearer the hole, on a part of the course in the bunker that affords maximum available relief from the casual water. When the bunker is being renovated and the committee defines the entire bunker as “through the green” (Decision 25/13). In all other cases, relief by dropping outside the bunker is under penalty of one stroke. Drop a ball in the bunker within two club-lengths of the spot where the ball lay, but not nearer the hole. Note that options b) and c) require that the ball be dropped in the bunker. Note also that option a) is the only option which might allow you to drop outside the bunker under this Rule. Note carefully that the relief options listed above for Immovable Obstructions and Abnormal Ground Conditions are not available when your ball lies in a water hazard. Also, the Unplayable Ball Rule does not apply when your ball lies in a water hazard. The water hazard Rule (Rule 26) is the only relief option available in these circumstances, under penalty of one stroke. Rules Of Golf: Where Can I Drop It? Roads And Paths: When Do I Get A Drop?